Across the continent, many of Africa's long-serving presidents have met their match in the form of online protests which test the strength of their ability to retain power. While countries like Uganda, Nigeria, and Rwanda have constitutions that technically guarantee rights such as freedom of association, speech, and assembly, these rights are often violated. Today, galvanised by increased connectivity, youthful pan-African online communities are using social media to speak out against this repression and support younger candidates vying for office in countries where leaders have clung to power for decades. 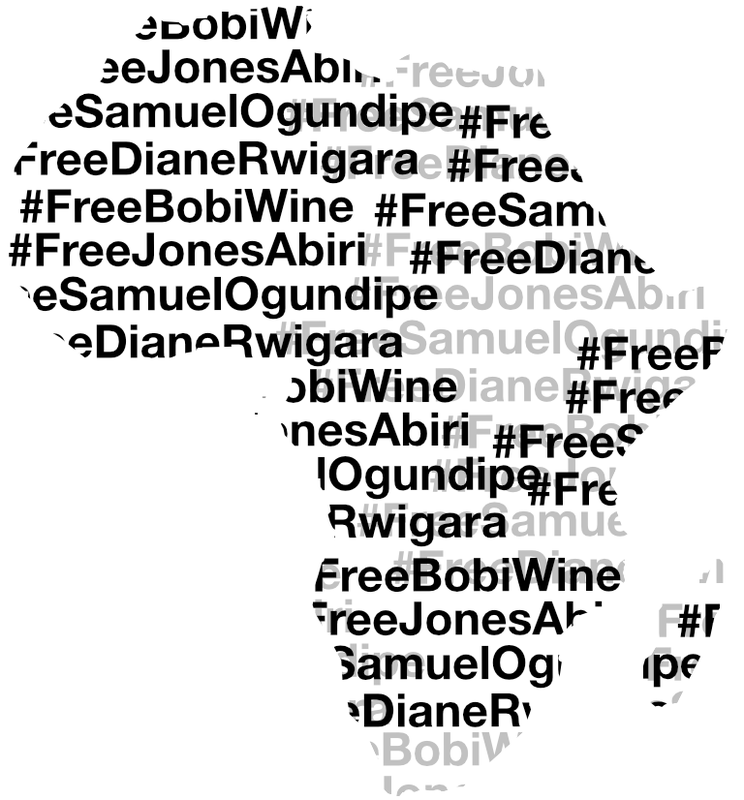 The last few months have seen unprecedented online activism, with trending hashtags such as #FreeBobiWine (Uganda); #FreeJonesAbiri and #FreeSamuelOgundipe (Nigeria) and #FreeDianeRwigara (Rwanda) created by African netizens to create awareness, solidarity and put international pressure on their governments. In December 2017, 74-year-old Yoweri Museveni, Uganda’s president for the past 32 years, saw the constitutional amendment for which he’d campaigned strenuously signed into law. The amendment removed the age limit of 75 years for presidential candidates, paving the way for Museveni to extend his rule  when his term expires in 2021. Most citizens favoured retention of the clause, and the Democratic Party ran a campaign called ‘Togikwatako’ (‘Hands Off’ in Luganda) to protect it. During the age-limit debates, the young musician-turned-politician Robert Kyagulanyi Sentamu—widely known as ‘Bobi Wine'—caught Museveni's attention with his growing following, both online and in rallies. Perhaps fearing Bobi Wine's influence, Museveni wrote a public letter  on a wide range of governance issues and pushed even harder to remove the age-limit clause. In the aftermath of Togikwatako, the government imposed a social media tax to “stem gossip,” which led to major social protests with Bobi Wine at the forefront. Bobi Wine has spurred political participation among young Ugandans who connect with his personal story and humble beginnings in the poor suburb of Kamwokya, where he built a music studio and launched a powerful career in the Uganda music scene. He went on to wage a successful parliamentary campaign  that beat challengers from both the ruling National Resistance Movement and the opposition in the June 2017 by-election. On August 13, 2018, Bobi Wine joined independent candidate Kassiano Wadri during a by-election in Arua to support Wadri’s campaign. Violence ensued after a presidential convoy was stoned and the state pointed a finger at Wadri's camp. Several parliamentarians and other people—including some who were nowhere near the scene—were arrested and brutally beaten . During the fracas, Bobi Wine's driver was shot dead while sitting in a parked car. It was later revealed that Bobi Wine had been the intended target. According to his lawyers, Bobi Wine was tortured and held in a military detention centre. The trumped-up charges were dropped after ten days but Bobi Wine was then immediately charged with treason. The remaining detainees were released on bail on August 27. Bobi Wine's brutal arrest and detention were met with international condemnation, igniting the trending hashtags #FreeBobiWine, #FreeArua33 in addition to street protests throughout the world, with the largest one held in Nairobi. A number of hashtags have trended this year in response to the Buhari administration's intimidation journalists and citizens. One of them concerns Jones Abiri, publisher of Weekly Source, who was arrested  on July 21, 2016, by state security (DSS) agents at his office in Yenagoa (Bayelsa State). The DSS accused Abiri of being a militant responsible for the “bombing of oil pipelines ” in oil-rich Niger Delta region. The government sustained  this narrative and further accused Abiri of lacking official journalism credentials. Human rights advocates  countered that Abiri was arrested for publishing ‘unpleasant’ information. The hashtag #FreeJonesAbiri  trended for several days on Twitter, and it worked: Abiri was released  on August 15, 2018, after a two-year detention. He has sued the government, demanding compensation in the amount of 200 million Naira (about $556,000 United States Dollars) for detention without a trial. Samuel Ogundipe was arrested by Nigerian police on August 14, 2018, for refusing to disclose the source  for a news story. According to police, Ogundipe leaked  a letter from Inspector General of Police to the Acting President, Professor Osinbajo, regarding the DSS's parliament siege. The police accused Ogundipe of publicizing a classified document, causing  “a breach of national security and a breakdown of law and order”. Netizens, civil rights advocates, and journalists around the world condemned Ogundipe's arrest and called on the government for his release. For days, #FreeSamuelOgundipe  trended on Twitter. Ogundipe was released  on August 17, 2018. During my detention, I had no idea of the magnitude of support that came in for me from the public. Upon my release earlier today, @PremiumTimesng  management explained that my freedom came because of the pressure you all mounted. Samuel Ogundipe was released  on August 17, 2018. On August 17, 112 women were arrested in Owerri  in southeastern Nigeria for staging a peaceful protest demanding the release of Nnamdi Kanu,  a separationist leader from the Indigenous People of Biafra (IPOB). Kanu’s whereabouts remain unknown  since last year after the Nigerian Army raided his father's house and the government declared IPOB a terrorist organization. The women's arrests ignited a social media storm leading to the trending hashtag #FreeOwerri112 . The women were released on August 24. Under President Paul Kagame's leadership, Rwanda boasts the highest proportion of women in government in the world. But in reality, women leaders acting outside the confines of the governing political party face the full wrath of the regime. First, it was 49-year-old lawyer and leader of the opposition FDU-Inkingi party Victoire Ingabire, who returned from in exile in the Netherlands to contest the 2010 election. Ingabire was arrested and charged  with collaborating with a terrorist organization and “genocide ideology.” She is currently serving a 15-year jail sentence. More recently, Diane Shima Rwigara, a Rwandan businesswoman who ran as an independent candidate in the 2017 Rwandan presidential elections, had her presidential ambitions cut short when she was disqualified by the Rwandan Electoral Commission. Rwigara was arrested last year on charges of “incitement and fraud ,” and been in jail for the past year. She faces a 20-year prison term. While Kagame serves as chair of the African Union in 2018 , many African netizens are calling for the release of his political opponents.